These shortcuts use the Windows key on the bottom of your keyboard, usually left of the Alt key. They work in Windows 7 or Windows 8. Open File Explorer/computer from anywhere with Windows key + E .
Minimize windows by hitting Windows key + ↓ . It’s easier in Windows 8 than swiping down. 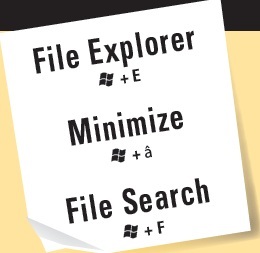 No more drilling down to file search if you use Windows key + F. Just type the file name to search.